The Indians were well prepared to take on Cape Fear CC tonight in the Region X tournament semi-finals, having beat them in their last meeting in Walterboro. The Indians came out early and the game plan seemed to be working once again as they took an early 16-point advantage in the first half. Sophomore Denzel Collins would get two early fouls and coach Garrett took him out the game. “We had a sizable lead and with him having two fouls, I figured we could hold the lead or at least keep them at bay until the second half,” said Garrett. The Indians were unable to hold the lead and Cape Fear came roaring back, cutting the Indians lead to only four 36-32 with 2:26 remaining in the first half. 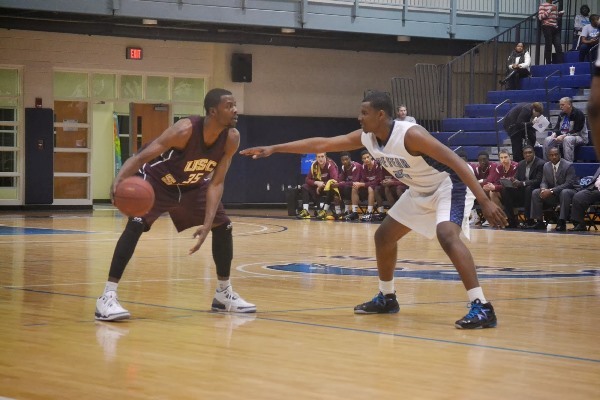 The score at the half was USC Salkehatchie 38, Cape Fear CC 37. In the second half, it was like a heavy weight fight early with both teams throwing blows but unable to knock out the other. It would be Cape Fear that would throw the hardest punch with 2:17 left in the game, jumping out to a 6-point lead, their largest of the game. Cape Fear CC would hold on to defeat the Indians 84-75. Cape Fear CC advances to face Brunswick CC on Saturday at 2:00 pm in the Region X men’s basketball championship. “We had a great season, I know the guys are all disappointed with the loss tonight but we will rise again. I told them we win as a team and lose as a team, it hurts now but tomorrow will be better. I take my hat off to Cape Fear CC, they wanted it and they never gave up. I wish my sophomores the best of luck in the future and to the freshman, I told them let’s work hard in the off-season. I want to thank our athletic director Jane Brewer for all of her support, she always stands with us and we appreciate that. The fans were great this season and I hope to see everyone out supporting us again next season,” said Garrett.